Automotive racing has always been a source for technical innovation, driven by the constant pursuit of the competitive edge. And with the budgets for the top racing teams in the world reaching half a billion dollars, the cost to win has never been higher. Research and development budgets have been reported as high as 100 million dollars per year alone. This expenditure and commitment to winning has resulted in great advancements in racing technology. But the financial burden to compete has also limited and excluded many smaller teams from the competition. To promote attract a more diverse field of teams and drivers, some racing leagues and series have moved to “spec” chassis and engine requirements. This means the entire field uses the same components supplied by one or two manufactures. And no development or modifications are allowed. This new regulation drastically reduces the cost to compete for individual teams, and promotes close racing since no one has a significant technical advantage. This also places more focus on the driver’s skills. Close racing has forced many teams to look for any advantage in performance they can find. With the rules limiting changes to most major systems, teams have focused on making improvements to smaller, unregulated components. 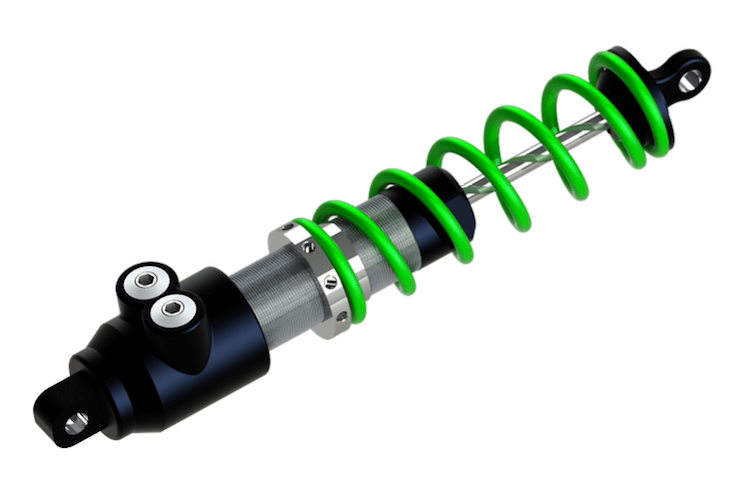 Suspension dampers, or shock absorbers, are a chief area of development. Complicated internal valving and structuring has meant the need for advanced seals is at the forefront. That’s where Eclipse comes in. Eclipse was approached by a top racing team that was looking for improvements in the internal sealing system of their gas shocks. A damper works by carefully controlling fluid flow through specially designed orifices and flow passages. This metering manages the response of the combined spring to control how the suspension works over bumps and cornering g-forces. The customer was using rubber X-Rings as the primary piston seals in their shocks. For dynamic applications, such as a shock, a X-Ring can provide a significant improvement in friction and performance over a standard O-Ring. They work by limiting the surface contact and load of the seal, enhancing the dynamic operation. While the X-Rings were technically sealing fine, the team was looking for any improvements they could find in friction reduction. With shocks having to respond to inputs from the road or track in milliseconds, any reduction in sealing friction will result in better performance as forces are better translated to the designed components. Lower friction means a smoother and faster response time and a more efficient damper by more completely directing the dynamic motion through the carefully designed valving and not being dissipated as heat. Eclipse was challenged to replace the X-Rings with the lowest friction seal possible, without compromising life or sealability. Eclipse had to first change to a PTFE based seal. We chose our ET002: Molybdenum Disulfide (MoS2) filled PTFE as the base seal material. PTFE’s coefficient of friction can be as much as 10 times lower than that of rubber. The blending of a small percentage of MoS2, which is a common solid lubricant, also further reduces the friction coefficient. ET002 is ideal for applications where low friction is the chief concern. The addition of the lubricant further enhances PTFE’s already excellent dynamic sliding capability. The next task was the choice of energizer for the seal. While a typical O-Ring Energized Seal would perform fine in terms of sealabilty and wear life, the friction due to the high unit loading of the O-Ring would be not acceptable in this application. Eclipse knew our Spring Energized Seals would be the right seal for the job, and their in-house manufactured Canted Coil spring would be the perfect choice. In dynamic applications, the most common spring types are either Cantilever or Canted Coil. When comparing the load versus deflection curves of these two springs, the Canted Coil has the unique property of having a virtual flat curve over a large portion of the deflection range. This means the load of the spring is almost constant over a range despite seeing increased compression. This is very different from Cantilever spring which has a linear response, more deflection equals more load. This unique property of Canted Coil Spring makes it ideal for applications where friction control is very important. The seal can be designed to operate in this constant load range allowing the friction of the seal to very carefully be tailored to specific requirements. Eclipse used our light load Canted Coil Spring in combination with a custom seal jacket design to allow for a seal with the absolute lowest friction possible — all while ensuring positive seal engagement and not compromising seal wear life. Looking at the complete sealing system of the piston, Eclipse decided we could take the design even further to reduce friction. The current piston utilized a polymer wear ring to provide guidance and prevent any metal to metal contact with the piston and bore. Eclipse designed the Spring Energized Seals to have a specialized extended heal geometry to properly support and guide the piston. Extended heel designs are typically used to help extrusion resistance in high pressure applications. In this case, the tight tolerance heel was designed to take the place of the separate wear ring currently in use. 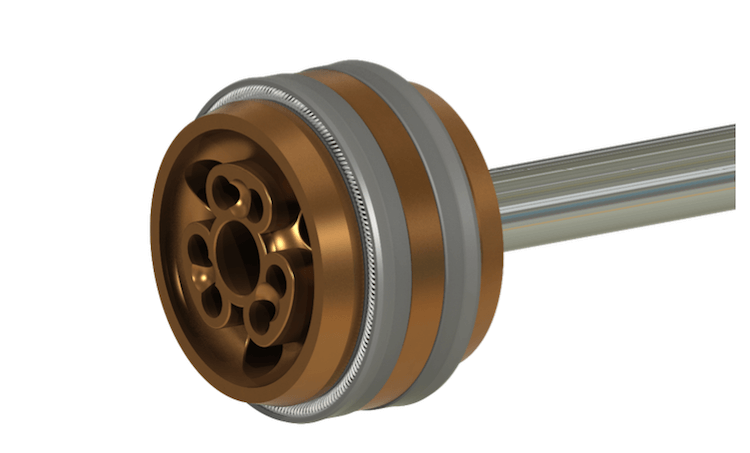 The seal geometry eliminated the need for the wear ring permitting the use of a smaller, more compact piston, which also translates to less weight. A lighter piston means better response time within the shock improving overall dynamics and performance. Eclipse’s seal design allowed for a massive reduction in overall system friction. The elimination of the piston wear ring by using specially designed extended heel seals meant further improvement to the shock absorbers performance. In a sport where fractions of a second can be the difference between first and fourth, the team was thrilled with the performance advantage made possible by Eclipse’s custom seal design. Contact Eclipse today if an ultra-low friction Spring Energized Seal could be right for your application.